If you want to ride on a London tram, you can always go to Croydon. But if you want to ride on a proper old London tram, a sleek double decker on rails, you need to head to Lowestoft. 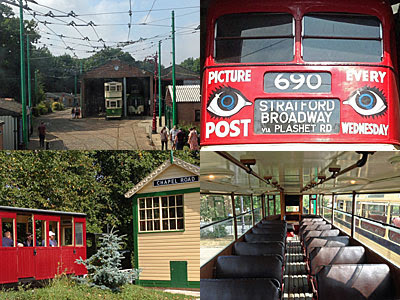 The East Anglia Transport Museum is located on the outskirts of town in Carlton Colville, just past the mini-roundabout and a new housing estate. The site is long and narrow, wide enough for two 'streets' leading down to a field at the far end. The museum kicked off in 1966 when a group of enthusiasts got hold of an old tram and wanted to restore it, gradually accumulating more stock and building more sheds to store them in. Not just trams, they also acquired trolleybuses, buses, road vehicles and a railway. This transport hotchpotch opened to the public in 1972, and they've been cramming in more and more ever since. 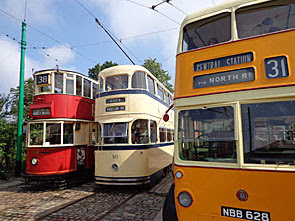 A selection of trams and trolleybuses run from the turning circle area near the museum entrance. They'll be different depending on the day you turn up, but might hail from Newcastle, Derby, Bournemouth, Blackpool, Amsterdam, wherever. Or London. The London tram dates back to 1930 and operated out of New Cross depot, with brakes resilient enough to run up Dog Kennel Hill in Dulwich. After two decades' service it was kept on public display at Chessington Zoo, then rescued by the team in Lowestoft when its space was needed for a new attraction. Car 1858 is the last functioning tram of its type, and looks rather splendid today. The vehicle is tall with two identical rounded ends, there being no need for a separate driver's cab thanks to tracks embedded in the road below. And then there are the cables draped out above the tramway, here mixed with those necessary for the trolleybuses to create a spiders web suspended in the sky. Take a seat - the best are in the comfy bays at the top of the stairs, and set off on a journey back in time. You don't go far. Trams head down to the end of the site, then left a short distance into the trees where the conductor hops off and tugs the electric connector round to face the other way. Meanwhile trolleybuses follow a brief looping route, three times, with the driver tugging hard on the wheel to round each corner. All the rides are staffed by volunteers, indeed the entire museum only functions because of their dedication. Some are here for the opportunity to drive, some only want to punch your ticket, while others are tucked away in the sheds repairing and restoring. Many, you suspect, are here for the chance to wear a beige and maroon trim uniform plus peaked cap. Others are here, you suspect, because their husbands are transportaholics so working in the cafe or shop is one way to share some time together. And most are either old or young, the former filling their post retirement years with something that's a lot of fun, the latter filling in time between school, college or university. Where else in Suffolk can you get the opportunity to drive a train several times an hour for the delight of passengers? Ah yes, a miniature railway also runs down the edge of the site, but don't come expecting a lengthy ride. Trains on the East Suffolk Light Railway take less than 90 seconds to chug from one terminus to the other, where the loco changes ends, then less than 90 seconds to head straight back. All the rides at the EATM may be short, but you can go on them over and over again at no extra cost. I was surprised to see how many chunks of London have been transported to this East Anglian outpost. One of the shorter roads has an original Islington street sign. The kerbs and trolleybus wires down one street were rescued from the Silvertown bypass. Three red London trolleybuses are preserved here, with route numbers in the 600s and destination boards including Stratford and Winchmore Hill. 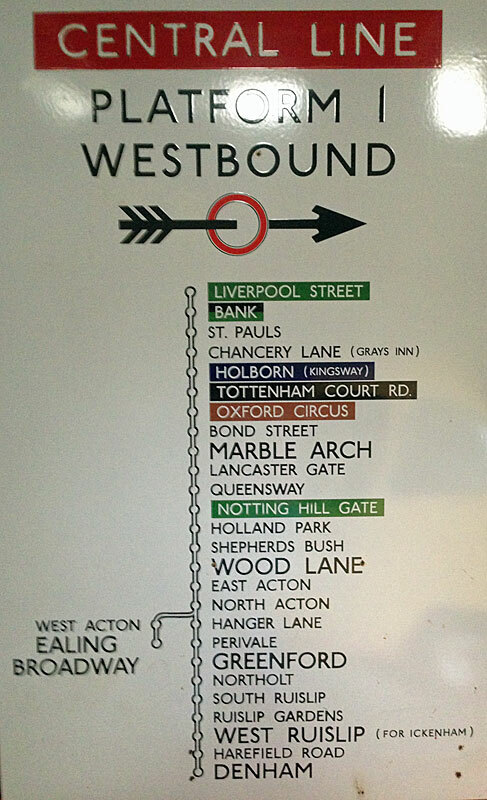 One of these never moves, but you can walk around inside and enjoy the designs of some original London Transport posters. Even one of the central exhibition huts contains the unexpected sight of a century-old Mornington Crescent roundel (which I showed you yesterday) and a Central line platform diagram showing the line extending to Denham. If anything there's more in this museum from London than there is from East Anglia, probably because trams and trolleybuses were urban creations and only a few local towns boasted them. Non-public transport also gets a look in, with vintage vehicles from an Austin saloon to a Trabant. Heritage lottery money has paid for a roadmaking exhibition based around a 100-year-old preserved steamroller. Elsewhere there's a K1 telephone box (that's rare), the obligatory Anderson shelter and some heritage shopfronts that even I found nostalgic. And the cafe's called the Terminus Tearooms, which proved more attractive its name suggested it would be. If you like this sort of thing - a collection of transport ephemera and perfectly preserved vehicles - be warned that this not-enormous site may be a long way to come. Also check the calendar before you set out, and never come on a Friday or a Monday unless it's a bank holiday. But maybe consider the End of Season Gala Weekend in a fortnight's time, where the volunteers pull out all the stops and run everything, even out into the surrounding town. It is, I can assure you, much more fun than merely going to Croydon.